“A generation that had gone to school on a horse-drawn streetcar,” Benjamin adds, “now stood under the open sky in a countryside in which nothing remained unchanged but the clouds.” This disconnect is not unlike our present day, as the introduction of the Internet and social networks slowly displaced real conversation and interaction, our identities replaced by a simulated second life filled with empty interaction. 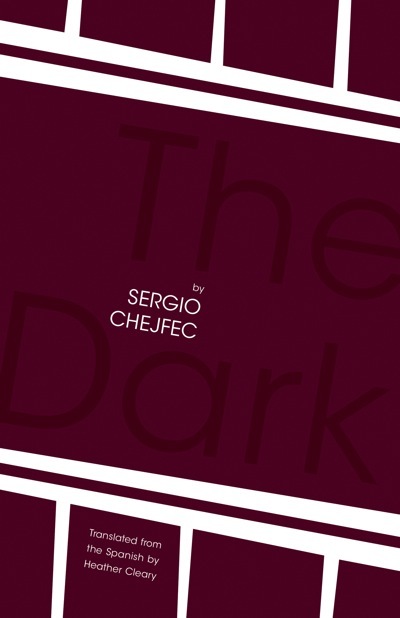 The unnamed narrator in Argentine Sergio Chejfec’s latest translated novel, The Dark, straddles these two worlds: the physical reality of his surroundings and the intangible yet boundless world of thought. While at times he seems a man of practicality, “the man who finds his way about the world without getting too deeply involved with it,” he continuously attempts to support his reasoning through literature. All walkers are consumed by their own literature, their own cultural history, the capitalist or urban economy. Thus I find as a way to write, it is a way to access the same urge as the contemporary, urban walker—the urge to know, to see that type of frustration, of weariness, of unease, of deception. Because the city promises you many, many things, but in reality is doing no more than showing you their possibility. The city the narrator wanders through, as the cities of Chejfec’s novels so often are, is an environment constructed by his own mind and recursive thought process: he is constantly thinking and retracing his thoughts, pacing back and forth, round and round. In this context, the city is both an internal perception and an external reality in line with the transcendental belief that, as David C. Smith wrote in “Walking as Spiritual Discipline,” “a person’s inner resources are sufficient to meet any challenge, that following the intuitions of one’s own genius leads to unexpected success.” Each walk “mark[s] an attempt to discover within himself the thoughts and intuitions which would tell him who he was, how he was to live, and what his proper relationship should be to self, nature, and God.” However, in The Dark, Chejfec proposes: what if a place is so ruined one is unable to distinguish between interior and exterior, observer and participant, literature and reality? As the narrator tells us, “Everything built is the promise of a future ruin, even new constructions. We live surrounded by debris; living in a house means inhabiting a ruin—and I don’t mean this only in a literal sense.” For Chejfec, time is always moving, and while the landscape is rarely described, the narrator creates a map from his recounted memories, drawing connections to distant times and places, and plotting points through his own emotional geography. However, unlike many of Chejfec’s other works, the world expands not through the nameless narrator but through his perception of another character, a young factory worker named Delia who is the object of his affections. No other character in the novel receives a name. Through Delia, the narrator tries to understand himself. Perhaps this was the source of the collective attachment to objects – the fact that they retained the marks of other ways of being used and handled, both unknown and essential, without which they would lose their true value. It is within these fragments that the narrator attempts to construct understanding since “the fragments better represent the whole of each of us . . .” The narrator spends the entirety of the novel telling and retelling his relationship with Delia: the evenings together walking through the town, the days watching her as she worked at the factory. Then, after an inexplicably violent sexual attack, she becomes pregnant and he abandons her. Why the narrator attacks and abandons Delia, he never explicitly explains. Half the art of storytelling is keeping a story free from explanation, to allow the reader to interpret things the way he understands them. This falls in line with much of Chejfec’s work. Each of his books is a seemingly simple story that is at times dense as well as unspooling. Instead of conveying information in an objective manner, the narrator sinks us into the story of his own life. However, there is an air of insecurity throughout his monologue, frequently injected with the narrator’s refrain of “I don’t know,” as if he is afraid of what he may find out about himself. A reality that had been concealed until that moment, lying in wait, reveals itself; nature is concerned only with hiding itself while characters submit to, are torn apart by, and retreat from its unfamiliar laws, and so on. The problem is that nature never alludes to itself, and the supernatural is the most innocent way it makes its presence felt. As we know, the prey gives life to the hunter. We live with our mistaken ideas about other people; life goes on as it always has until one morning, or any other hour of the day, some unexpected sign shakes us up, and we’re left puzzled, aware that we have been in the grip of errors and falsehoods all along. It is within this distance between the narrator and the reader where the book fails. How can we accept this woman, who he abandoned without explanation, means everything to him? How can we understand his inexplicable sexual attack when the narrator is too ashamed to recall it? According to Benjamin, readers of the novel “look for human beings from whom he derives the ‘meaning of life.’” However, we never hear from Delia, only the paraphrase of stories, the “proletarian nature” of her actions, “the fact that she was answering me before a question was ever asked.” She is presented as always waiting any and everywhere for the narrator, “regardless of the weather,” until one day she is gone. Page to page, The Dark is as interesting as any of Chejfec’s work – tangential yet intelligent, frustrating yet captivating. However, as a whole, the novel never comes together. Its aphorisms and ideas are interesting, but many of them stray too far from the emotional core of the narrative. Chejfec is too often analytical and plodding when the prose should be deeply felt. He fails to connect to the reader, not in his ability to relate the narrator’s life, but in the inability to relate to “the experience of others.” In the end, the narrator is alone, in his room, where he walks “around every day. Before, Delia and I used to walk through the city and its surroundings; now I keep to these four walls.” Through his story, the narrator hopes to understand his actions; however, like us, he’s left in the dark. Justin Alvarez is the digital director of The Paris Review. His work has appeared in Ploughshares, Guernica, and Flatmancrooked's Slim Volume of Contemporary Poetics. He lives in New York City.